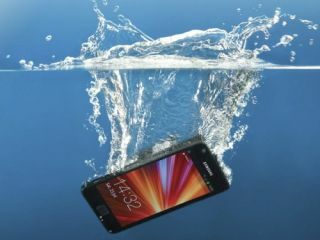 A new treatment called HZO could soon appear in phones, making them waterproof inside and out. The technology was shown off at this year's CES show in Las Vegas as the manufacturer dunked phones in a fish tank to demonstrate the treatment's water-repelling properties. Mobiles in the testing line-up included an iPhone and models from Samsung and Motorola. Unlike other waterproof measures, HZO doesn't just waterproof the outside of the phone. The treatment is applied to the phone during manufacture, coating the internal electronics, right down to the smallest "nook and cranny", according to the promotional video. The company claims that its "invisible vapor coating" protects electronics at the molecular scale with HZO nano-sized molecules. If it's as effective as claimed, the treatment could end the need for most waterproof cases, protecting gadgets from accidental dunkings or sweat damage when exercising. "We showed the Samsung Chairman the technology with a Samsung Galaxy S that we had coated with HZO and he couldn't believe his eyes," a representative of the company told Pocket Lint. "Samsung is really excited by the tech." HZO says it has been in talks with Apple and that some of next season's phone's could well be waterproofed with the technology.